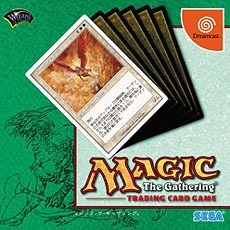 The Sega Dreamcast Magic: The Gathering game was released in Japan on June the 28th in 2001 for 6800 Yens. 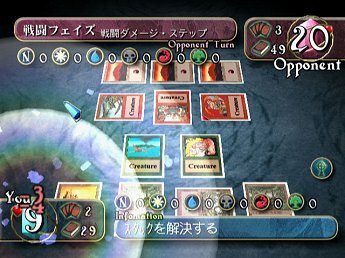 It features a duel mode where players can compete versus the computer. The game takes place in the town of Magic Heart, and it's surrounding areas of Murg, Camat Island, Lydar Forest, Yeluk, Tornell, and The Balance Tower, each representing a basic land that the opponent's decks will be based around. 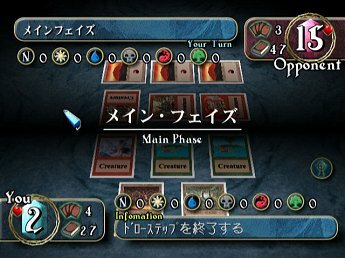 The game uses a total card pool of 369 cards which consists of the complete 6th Edition set (350 cards), 9 additional cards of earlier core set editions or expansions (Alliances, Stronghold, Tempest) and 10 special cards which are not available in physical form and which incorporate various random attributes that would be difficult or impossible to replicate in real life. Magic: The Gathering Dreamcast game Rare sealed Sample version front and back (This is an ultra rare version).